Where serious beer drinkers are concerned, warm beer is a big no-no, and even more so when the glasses or mugs that those beers are served in are not chilled in the first place. Basically, the entire experience goes to shot, especially if you are in a bar and would love nothing better than to knock back a few pints of the finest brew on offer. 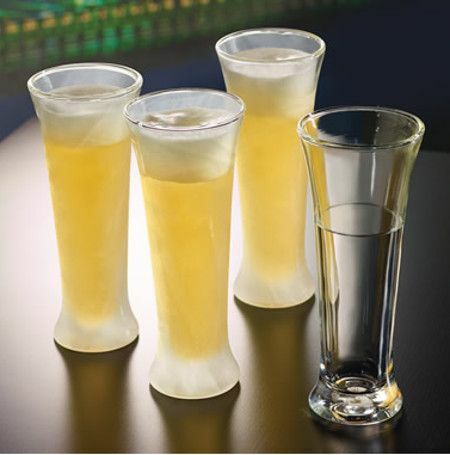 While we have come across a Chill Maintaining Wine Glass recently, beer lovers are not forgotten, thanks to the $79.95 Chill Maintaining Pilsner Glasses. The Chill Maintaining Pilsner Glasses are pretty much self explanatory – these happen to be pilsner glasses which will ensure your favorite brew of beer remains chilled between 32° F and 36° F for up to 30 minutes. How is this made possible? The answer is pretty simple – it boasts of double-walled glasses that have a viscous cooling liquid right smack between both layers which takes an hour to freeze, hence letting the glasses chill a room-temperature libation to 36° F in a short 2.5 minutes. Made out of durable, borosilicate glass which can withstand temperature extremes of -22° F to 482° F, your hands won’t be freezing either when handling this since the double-walled construction helps prevent that from happening. Of course, there are also other alternatives out there to this, so take your pick.